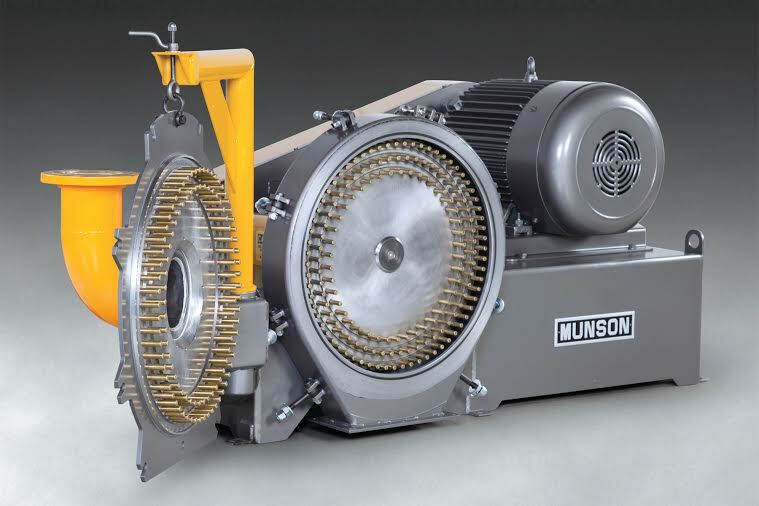 UTICA, NY — A new 24-inch (610 mm) diameter Pin Mill model CIM-24-MS from Munson Machinery grinds, sizes, de-agglomerates and homogenizes friable or other materials into controlled particle sizes, from coarse to fine (400 mesh). Also known as a Centrifugal Impact Mill, it is equipped with a stationary outer disc and a rotating inner disc, both of which are precision-machined and studded with impactor pins. As material enters through the center of the outer disc, centrifugal force created by the rotating inner disc propels the material radially through a destructive path of five intermeshing rows of rotating and stationary pins, producing the tight particle size desired by controlling the infinitely-variable rotor speed. Higher speeds to 5400 RPM pulverize friable powders, flakes and granules into fine grinds while killing any insects, eggs and larvae. Slower speeds down to several hundred RPM provide coarse grinding and de-agglomerating. Typical applications include rice flour, starches, sugars, spices, vitamin powders, grains, sodium compounds, fertilizers, resins, clays and other friable products. The infeed of the stationary outer disc can be equipped with flanged, threaded or other fittings for gravity-fed or inline-pneumatic applications. The rotating disc rides on oversized pillow-block bearings and is driven by a 40 to 60 hp (30 to 45 kw) motor with V-belt/sheave arrangement, delivering high throughput per hp/kw compared with machines employing screens, hammers, knives or rolls. The stationary outer disc disconnects using quick-release bolts and swings open on a cantilevered arm, providing full interior access to both discs for rapid cleaning or sanitizing. Constructed of mild steel with abrasion-resistant disc pins and durable exterior finish, it is available with all material contact surfaces of stainless steel finished to food and pharmaceutical standards, and of abrasion-resistant steel for processing of exceptionally hard or sharp materials. Other models are offered with discs from 8 to 34 inches (203 to 864 mm) in diameter, and drives from 15 to 125 hp (11 to 93 kw) with multiple V-belt and sheaves, and direct drives. The company also manufactures Screen Classifying Cutters, Attrition Mills, Rotary Lump Breakers, Rotary Knife Cutters, Hammer Mills, Shredders and other size reduction machinery. Blending equipment includes Rotary Batch Mixers, Ribbon/Paddle/Plow Blenders, Fluidized Bed Mixers, Vee-Cone Blenders, Rotary Continuous Mixers and High Intensity Blenders.